We're always striving to improve MakerPlot along with your experience with it. Here are some of the most recent upgrades we've made to it...and they come with the FREE Trial and Purchased versions....plus, you can always upgrade FREE by downloading here. MakerPlot's Internet communications allow you to remotely control and view what your data is doing, without your device being right next to your computer. These controls can be downloaded to most interfaces; consult our Guide for details. So besides serial communications, you now have Internet communications, as well. Load speed has been significantly increased, especially on laptops, by allowing you to limit the number of COMM PORT numbers that are searched at program launch. Before this change MakerPlot searched for up to 255 COMM ports, which is a lot for a normal program environment; this search now defaults to 15 COMM ports. However, you can increase this number up to 255 if you choose by the following pop-up screen and in the Configuration -> Port tab pull down menu. Now you can capture both analog AND digital data DIRECTLY from an instrument like a digital scale, GPS receiver or anything else that outputs data to a terminal program. 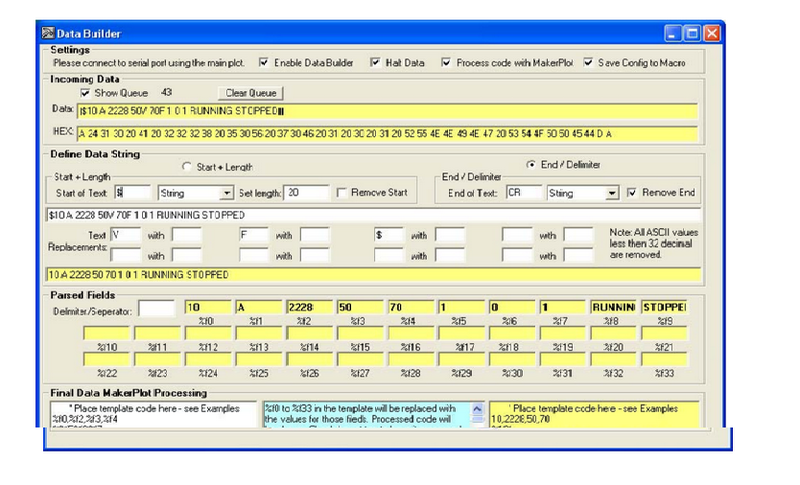 The Data Builder allows capture of incoming serial data and parsing of string and fields for use in MakerPlot processing. To access the screen below, click View -> Data Builder NEW and see our Guide for full details. 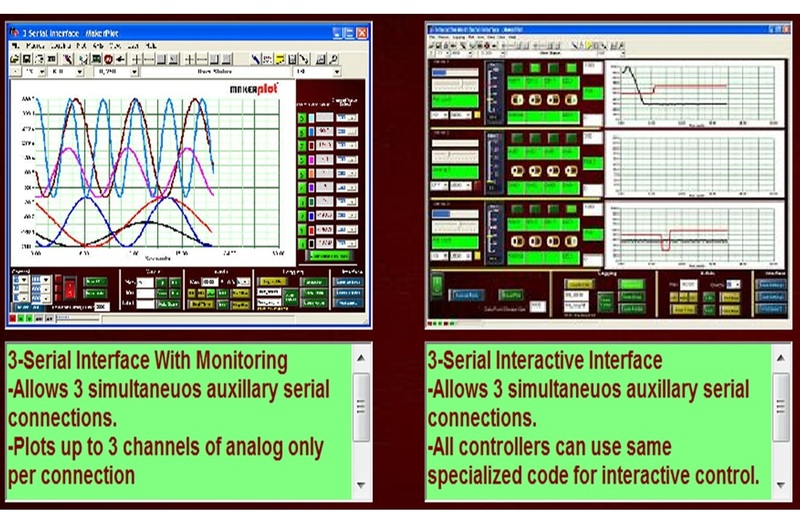 Plot From Multiple Micros "At Once"
Our NEW 3-Serial Interfaces allow you to plot from 3 separate serial ports, which means that you can have analog serial data streaming from up to 3 separate micros "at once"